The Ross Surname is Scottish in origin. Isaac Ambrose Ross was born circa 1752, probably in Virginia. He died on December 23, 1821 in Garrard Co., Kentucky 4. There are no clues or links to his ancestry. As a youth he came to Kentucky, where he was an original settler of that state. Ambrose married to Elizabeth Gordon on April 4, 1786 in Lincoln County, Kentucky. They eventually moved to Garrard County, Kentucky. Ambrose and Elizabeth had 6 children: Samuel (see next generation), Mary, Nancy, Thomas, David, and Robert. While living in Kentucky, Ambrose served in the American Revolution in the Kentucky Militia. Ambrose died on December 23, 1821 in Garrard County, Kentucky. His widow Elizabeth died in 1844. Both are buried in the Carpenter Cemetery, Garrard County, Kentucky. Isaac married Elizabeth Barton Gordon on April 4, 1786 in Lincoln Co., Kentucky 5. She was born on March 30, 1765 in Lancaster Co., Virginia. She died on December 13, 1844 in Garrard Co., Kentucky 4. 2 Mary Ross was born on November 1, 1788 in Garrard Co., Kentucky. She died on April 5, 1854 in Kansas. She was married to Robert Carpenter on April 5, 1806 in Garrard Co., Kentucky. 3 Nancy Ross was born on August 23, 1796 in Garrard Co., Kentucky. She died on October 3, 1856. She married Robert Smith. 4 Thomas Ross was born on March 2, 1802 in Garrard Co., Kentucky. He died on February 15, 1859. He married Milly Nelson in 1832. 5 David Gordon Ross was born on July 18, 1809 in Garrard Co., Kentucky. He died on January 22, 1888 in Garrard Co., Kentucky. He married Edna Sims in Garrard Co., Kentucky. 6 Robert Ross was born circa 1810 in Garrard Co., Kentucky. He married Elizabeth Kirkendall on May 12, 1828 in Garrard Co., Kentucky. Samuel W. Ross was born on February 16, 1787 in Garrard County, Kentucky. He died on September 17, 1846 in Shelby Twp., Ripley Co., Indiana 1. He is buried in the Hebron Baptist Church Cemetery, Monroe Twp., Jefferson Co., Indiana. Samuel was raised in Garrard County, Kentucky, where his family were among the original settlers. Samuel was married on September 16, 1808 in Garrard County, Kentucky, to Hannah Jameson. They continued living in Garrard County and had 7 children: Nancy, Catherine (see next generation), Isom, Mary, Perry, Elizabeth, and Marshall. In about 1819-1820, Samuel moved with his family to the state of Indiana, where they settled first in Jefferson County, Indiana. Within a few years they moved to neighboring Ripley County, Indiana, where they settled on a farm in Shelby Township. 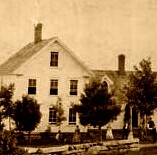 Samuel and his family were Baptists and made use of the Hebron Baptist Church in neighboring Jefferson County, Indiana. Samuel died at his home in Ripley County, Indiana, on September 17, 1846, at the age of 59. His widow continued living in Ripley County until her death in 1865. Samuel married Hannah Jameson on September 16, 1806 in Garrard Co., Kentucky. She was born on January 22, 1786 in Snow Creek, Franklin Co., Virginia 1. She died on February 3, 1865 in Shelby Twp., Ripley Co., Indiana 1. She is buried in the Hebron Baptist Church Cemetery, Monroe Twp., Jefferson Co., Indiana. 1 Nancy Ross was born on August 6, 1807 in Garrard Co., Kentucky. She died on January 23, 1892 in Ripley Co., Indiana. She married David Watts on September 17, 1824 in Ripley Co., Indiana 3. 3 Isom Ross was born on October 20, 1810 in Garrard Co., Kentucky. He died on October 16, 1896 in Madison, Jefferson Co., Indiana. He married Eliza Gay Robbins on August 23, 1836 in Cincinnati, Hamilton Co., Ohio. 4 Mary Ross was born on October 8, 1812 in Garrard Co., Kentucky. She died on July 28, 1850 in Logansport, Cass Co., Indiana. 5 Perry I. Ross was born on June 13, 1814 in Garrard Co., Kentucky 1. He died on March 27, 1891 in Shelby Twp., Ripley Co., Indiana 1. He is buried in the Hebron Baptist Cemetery, Monroe Twp., Jefferson Co., Indiana. 6 Elizabeth Ross was born on December 3, 1816 in Indiana. She died on February 3, 1907 in Rochester, Fulton Co., Indiana. She is buried in the Horton Chapel Cemetery, Liberty Twp., Fulton Co., Indiana. 7 Marshall Ross was born on March 2, 1819 in Indiana. He died in Indiana. He married Mary McGonnegall. Catherine Ross was born on December 25, 1808 in Garrard County, Kentucky 1,2. She died on September 13, 1876 in Monroe Twp., Jefferson Co., Indiana 1,2. She is buried in the Hebron Baptist Church Cemetery, Monroe Twp., Jefferson Co., Indiana. She was probably named after her maternal aunt Catherine Jameson Perrin. Catherine was raised in Garrard County, Kentucky, but as a child she moved with her family to Indiana. They first settled in Jefferson County, Indiana, and then moved a short distance away to Ripley County, Indiana. Catherine met and became engaged to a local man from the area named James Custer. James Custer and Catherine Ross were married on February 26, 1828 in Jefferson County, Indiana. After the marriage, James Custer purchased a farm of 160 acres in Monroe Township, in Jefferson County, Indiana. James and Catherine lived the remainder of their lives on this farm. Catherine had 13 children: Mary, Samuel, Arnold, Isom, James, Jesse, Nancy, Elizabeth, Martha, Sarah, Hannah, Catherine, and William. Catherine and her family were members of the Hebron Baptist Church in Monroe Township and were farmers. According to a letter written by her husband James, Catherine weighed 250 pounds and that “a better woman never lived.” Catherine died at her home on September 13, 1876 at the age of 67. Her husband James Custer died in 1887. Both were buried in the Hebron Baptist Church Cemetery in Jefferson County, Indiana. Catherine married James Custer on February 26, 1828 in Monroe Twp., Jefferson Co., Indiana 2,3. 2. Custer, Milo. Custer Genealogies. M. Custer, Bloomington, IL, 1944.